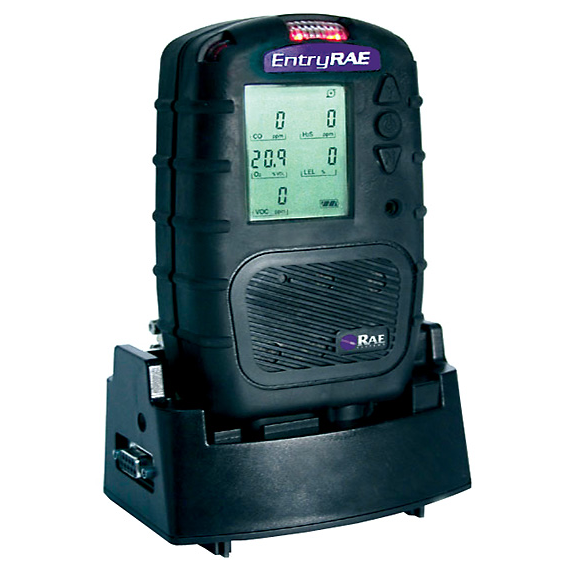 RAE Systems EntryRAE 4-gas Meter w/ PID | Enviro-Equipment, Inc.
Superior, affordable protection from the expected and the unexpected. Detects Oxygen, Combustibles, Carbon Monoxide and Hydrogen Sulfide and adds broadband protection from VOCs with a PID. The EntryRAE is a reliable, durable 4-gas-plus-PID monitor. Easy to operate, simple to calibrate, the EntryRAE delivers added protection without added complexity. Our plug & play, self-cleaning (patented) PID is the most reliable and durable PID available today. Add the AutoRAE, for automated bump test and calibration and the EntryRAE is the most powerful and easiest to maintain monitor. The EntryRAE adds a modular PID (photoionization detector) to the standard four sensor configuration of a confined space monitor (O2, %LEL/%Vol, CO and H2S). The PID's ability to provide accurate (parts-per-million) "broadband" detection of a host of common, highly toxic and flammable compounds makes it a necessity in today's modern industrial environment. Easy to use and easy to calibrate, the EntryRAE delivers the only modular, self-cleaning PID on the market today. A rugged, rubberized body, big display, loud alarm and built-in sampling pump make this a solid, compact workhorse for Confined Space Entry and other all-day, everyday on the job applications. Superior, affordable protection from the expected and the unexpected – EntryRAE.